You remember the famous line Shakespeare’s Juliet says to her Romeo, “What's in a name? That which we call a rose by any other name would smell as sweet.” Well, I beg to differ, Miss Capulet. Here in the Stringing and Beadwork offices, we place high importance on names, or, in our case, titles. For instance, would you, dear Beading Daily reader, prefer to make a project called Red and White Beads on Steel Wire Necklace or Beach-ball Bling? I rest my case. 1. Keep it short. One to three words is best. In Stringing magazine, we don’t have much room for titles—they have to fit on one line. Keep in mind that it’s not necessary to say “Necklace” or “Bracelet” in the title, either. Usually the introductions and/or photos clarify what the project is. 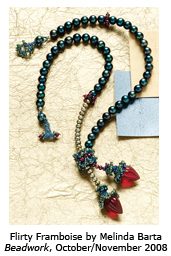 Here’s a shorter-is-better example: Lorelei Eurto’s fabulous necklace on the cover of the new Stringing Spring 2009, A Jealous Mistress, was originally named Art Is a Jealous Mistress for the saying on her focal piece. We took off the words “Art Is,” which shortens the title but retains the intrigue. 2. Relate it to your design without being too literal. Think about it: If all titles were literal, every project in Stringing would be called Pretty Strung Necklace or some variation of that. When naming your project, think about what materials are used, what/who your project reminds you of (could be an emotion, a character in a book, a season, a place, etc. ), or what distinguishes your project—is it simple, colorful, striking, etc.? Molly Schaller chose an excellent name for her piece in Stringing Spring 2009 that was designed around a pewter pendant with a bubble design: Effervescence. It’s short and it describes the bubbly nature of the project. 3. Make them fun! Alliteration. Onomatopoeia. Figures of speech. Plays on words. Kookie references. Bring it on! 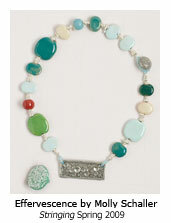 Everything about making jewelry should be fun, after all. 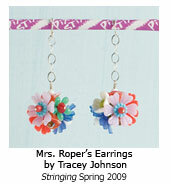 One of my favorite titles from the new Stringing Spring 2009 is Mrs. Roper’s Earrings. The colorful floral earrings were created (and named) by Tracey Johnson, whose title pays homage to the flashy landlady from the late-seventies show Three’s Company. 4. French-ify it! A joke we have here in the Stringing and Beadwork office is that when all other ideas fail, find a French word to throw in your title. Don’t believe me? I named a project Enamel Amour in my upcoming book with coauthor Melinda Barta, Beadwork’s editor, Mixed Metals: Creating Contemporary Jewelry with Silver, Gold, Brass & More. And Melinda named a beautiful berry-inspired necklace she made for Beadwork (October/November 2008) Flirty Framboise (framboise being French for raspberry). French words just have that je ne sais quoi. Remember to send me your titles (and the projects attached to them) for consideration in Stringing magazine. See the contributor guidelines for details and upcoming deadlines. 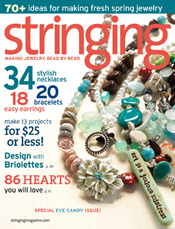 Danielle Fox is the editor of Stringing, author of Simply Modern Jewelry, and coauthor of Mixed Metals. If you have questions or comments for Danielle, please post them on the website.